This bowl with a flaring rim has a deep curving body and a short foot ring. The outer wall is covered with a light pink glaze as a base, on top of which is engraved patterns of plants and geometric designs. 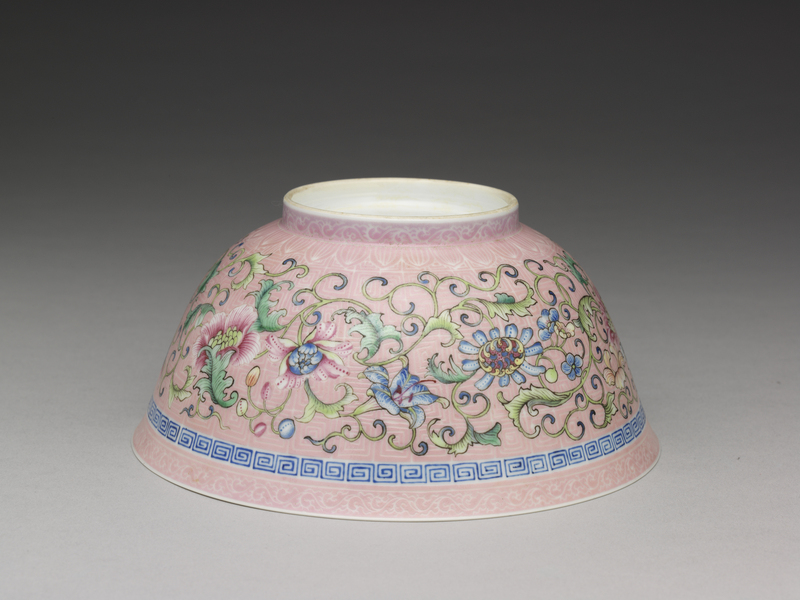 Painted on top of the pink enamel are winding stalks of lotus flowers, and near the rim is an encircling geometric pattern in blue pigment. 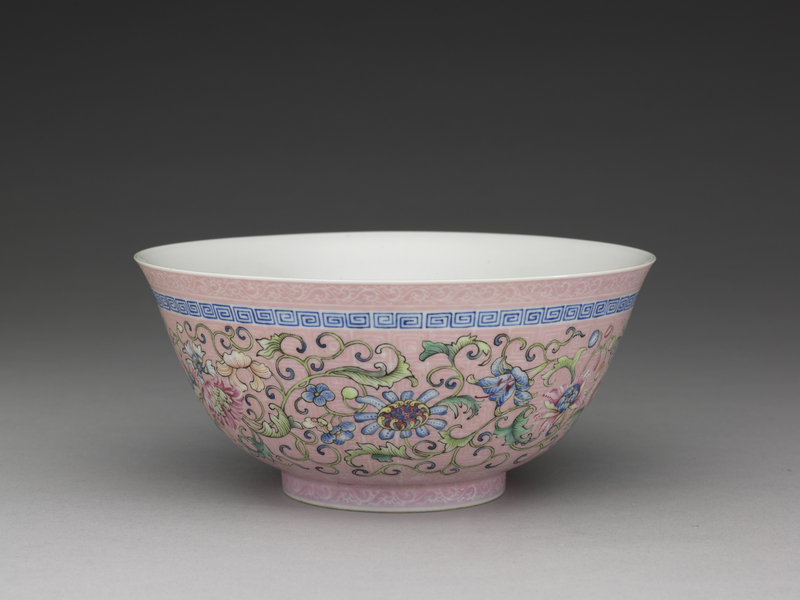 In the bowl is painted a stalk of tuberose, while appearing underneath is a blue four-character inscription in regular script that reads "Made in the Qianlong Reign." The walls of the bowl are as thin as paper, the flowers as dense as a brocade, the colors opulent yet elegant, and the lines crystal clear, making this a representative example of official ware from the Qianlong reign. 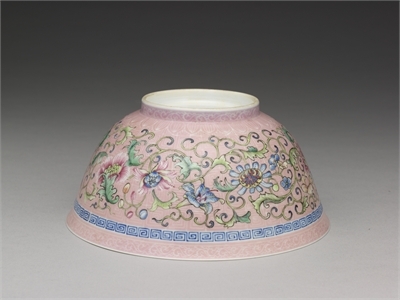 The official kilns of the Qianlong reign excelled at producing painted porcelains with intricate designs, "Famille Rose Flower Vase" particularly expressing the density and delicacy of flowers. Compared to the "Famille Rose Flower Vase," this bowl appears even more worthy of study. From a distance, the light pink underglaze looks like a plain layer, but upon closer inspection reveals that the glaze surface was first engraved with a sharp tool to pick away at the underglaze, creating the base brocade pattern. Then various flowers were painted on top of this pattern, creating the effect of adding flowers for various layers of decoration. According to records from the archives of the Imperial Bureau of Manufacture, imperial kiln workshops fired porcelain-body wares with "added flowers on brocade" against backgrounds of green, yellow, white, red, and moon-white. This would indicate that the decoration of "flowers added on brocade" was popular in the Qianlong reign.